And voila! I have finally developed my own doily pattern. Please do not tell me it looks like a doily you’ve seen before. Just let me keep living my dream. It took a few days to develop and write it/crochet it, the first time. Then it took another day for me to test it myself. I watched 2 seasons of Buffy through out, taking breaks for super demon battles and lovesick vampire scenes. I fixed a few errors in my pattern and…I’m done with it! It’s been so satisfying. The pattern will be released in the fall (wompwomp, you have to wait!). I’ll have more details soon. I enjoyed this pattern development–and come on, the end result is a beauty, no?–so much, I’m already drafting a second one. It’s a little less intricate, so perhaps I can release it sooner. I’ll keep you posted! I haven’t watched Buffy in quite awhile, I’m probably going to steal it from my dad now and watch it! Oh my goodness, I love it!!! Love, love, love!!!!! Wha-whaaat?! I thought I was the only one who watched Buffy while crafting! Haha. Actually I finished all 7 seasons of Buffy and I’m onto Angel now :-o Your doily looks great! Looove how big it is. 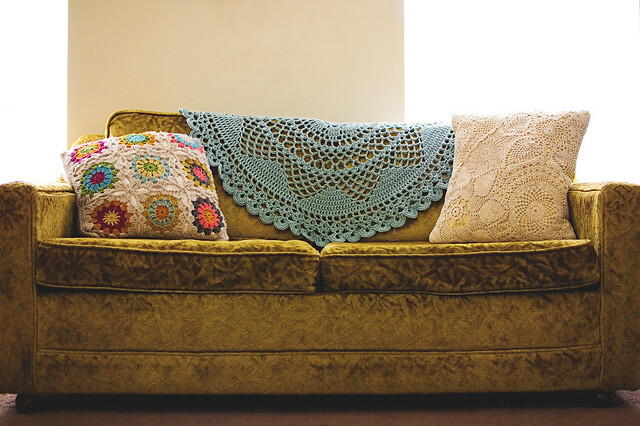 I would never be able to crochet a doily that big. It’s gorgeous. It looks great! Congrats on the pattern. It looks great! I love it, I can’t wait until you release the pattern! Gorgeous. I love it. What size yarn or thread did you use? Worsted + 6mm (J) hook! Fantastic. It looks so much more delicate. Most people are intimidated by crochet thread and would never try a doily so this a fabulous example of what you can do with thick yarn. I can’t wait to see the pattern. You rock. And doilies rock. It’s beautiful- can’t wait for you to release the pattern! That would look lovely on the back of my couch, too! :) Very nice work.